[Jesus said,] "I have loved you even as the Father has loved me. Remain in my love. 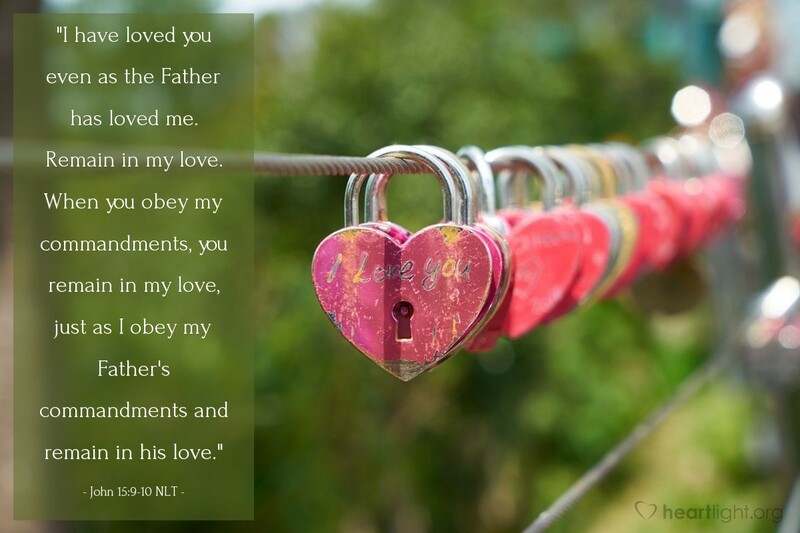 When you obey my commandments, you remain in my love, just as I obey my Father's commandments and remain in his love." When little children are disciplined for playing in the road or walking on railroad tracks, they see the discipline as painful, unnecessary, and limiting. They don't want limitations. However, if they could understand the danger and the parents' desire to protect them, they would see that discipline as loving. A parent calls on a child to obey because obedience protects and blesses that child. Likewise, when Jesus asks us to obey, let's not see it as something onerous, burdensome, and limiting. Instead, let's see Jesus' command, and our obedience to that command, as the protection of a loving Savior trying to safeguard, bless, and care for his beloved younger brothers and sisters. When we obey Jesus, we remain under the protection of his love rather than in the danger of our rebellion! Almighty God, your ways are not my ways. Your understanding is way beyond my understanding. So I trust that when you call me to obey, you do so because of your protective love. Please know that I will do my best to obey you and your Son in order to show you my love in return. In Jesus' name, I pray. Amen.